A massive flood threatens as the Christmas season dawns in the Houston Galveston area. People living there don’t expect a white Christmas but they hope for a dry Christmas. Then there is a murder and it turns out the only real stranger among them is a detective whose presence is hardly coincidental. 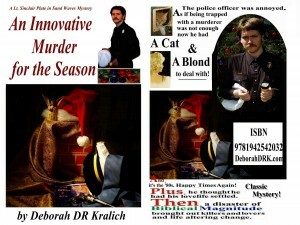 An Innovative Murder for the Season is a classic mystery in the tradition of those plots where a group of seemingly unrelated people are trapped with a murderer and must expose the killer or risk becoming victims. Her words were interrupted by a sudden monumental flash of lightning so close, for several seconds everyone thought the building itself had been struck. Thunder boomed, more lightning danced around. The lights went totally out and there were screams from every section of the store. Then, as suddenly as the lights went out, they flared back on again, not only bringing back on the bright fluorescent lights, but initiating the loud Christmas music medley beginning with Jingle Bells. The animation on the three major displays quickly brought movement and all the mannequins appeared to come to life. Janey’s eyes had never left the Sleeping Beauty Display during the electrical short circuit and she was still staring at it when the power surged back on and the music played and the display started to move. At last she saw what was wrong. Sleeping Beauty was rising up. The Prince was leaning towards her, all normal. But there was someone between, caught in the middle of their mechanized, unstoppable embrace. Randy stood entranced behind her. JW and Deidre came running from direction of the Santa Display. Mark and Eileen came running from the dressing room. Arthur walked behind them, saw what was happening, realized at once it could not be stopped and what that meant. He ran to Randy’s side. Aerial screamed then. Daphne, Laurel and Misha came out the staircase door, raced to the front and stood entranced with the others in the lobby at the exact moment that Sleeping Beauty and her Prince entangled in their embrace the trapped body of a woman with long straight streaked blonde hair and crushed it between them. Only the woman’s hair slowly becoming streaked with blood was visible as the fairytale characters clutched each other. Then the animation continued. The Prince withdrew from his sweetheart and Sleeping Beauty reclined back down on her bed. The female human body between them draped dramatically forward, arms stretched over the head which now fell upside down over Sleeping Beauty’s breasts. Visit all our online locations for more unique Barbie treasures - past and present. Bratz Doll with Dangerously Cool Accessories-Pistols in Holsters!